Mike Haynes played cornerback who played for the New England Patriots and the Los Angeles Raiders. He used his speed, quickness and range to become both a premier defensive back and an outstanding punt return specialist. He played the last five games in 1983 with the Raiders and then started and had one interception in their Super Bowl XVIII victory. In seven seasons with the Raiders, Haynes returned only one punt but he added 18 interceptions to give him a career total of 46 which were returned for 688 yards and two touchdowns, including a team-record 97-yard return against Miami in 1984. Haynes was an All-Pro choice in 1977, 1978, 1982, 1984 and 1985 and an All-AFC pick eight times. In 1997, he was elected to the Pro Football Hall of Fame. 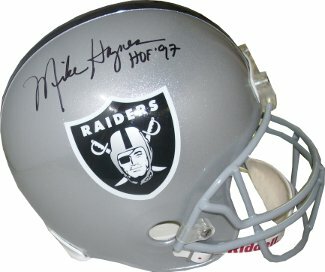 Mike Hayes has hand signed this Los Angeles Raiders Replica Mini Helmet with HOF 97 inscription. GT Sports Marketing Hologram and Certificate of Authenticity from Athlon.